The only hotel accommodations inside the park! Look forward to seeing Orcas, Minke Whales and other wildlife! Glacier Bay National Park & Preserve, AK — a World Heritage Site in the United States — is a 3.3 million acre treasure of natural wonders and wildlife near Juneau, Alaska. Magnificent glaciers, towering snow-capped mountains, abundant birds & wildlife, and mile after mile of pristine coastline. Whether you are here for a day or a week, you'll find endless opportunities for discovery and adventure here. Glacier Bay Lodge, nestled under the spruce trees that line Bartlett Cove, offers the only hotel accommodations within the park. 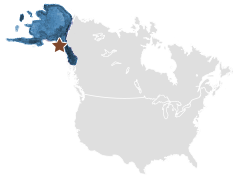 #MyGlacierBay Live it and share it - use #MyGlacierBay and you could be featured on our site!